To rebuild credit after bankruptcy, you need to have a plan. That plan has to be better than the one that landed you into bankruptcy in the first place. Sure, it’s a huge relief to have all that debt off your shoulders, but the bankruptcy will be on your record for the next 10 years for those who filed for Chapter 7. On the other hand, the older the bankruptcy is, the lower the impact it will have on credit offers. In other words, potential creditors will consider the most recent activity the most important information. To rebuild credit after bankruptcy, you must regain the trust of creditors. If your debt has spiraled out of control, a fresh start may be exactly what you need. Call the bankruptcy attorneys at Allmand Law Firm, PLLC at (214) 740-3682 and we can start discussing your situation. Contrary to popular belief, your credit isn’t “ruined” because you filed for bankruptcy. On the other hand, it isn’t in a very good place either. It has to be rebuilt from scratch. Before we get into that, however, let’s take a look at why you might be an attractive prospect to potential lenders. Firstly, if you’ve filed for Chapter 7, it will be another 8 years before you’re allowed to file again. Secondly, a lender likes to see that you can pay for your basic needs, handle the potential debt you will be incurring, and still have money left over. After your Chapter 7 was granted, you had all or most of your debt cleared. So basically, you’re not as much of a risk to a creditor as you probably think. Rebuilding credit isn’t hard, but it isn’t like building credit either. You’re not a risk to creditors because they don’t know anything about you. You’re a risk to creditors because you didn’t pay back the money you owed. Now, you just need a workable strategy on which to operate. The first thing you want to do is check out your credit score. If there are claims against you that you think are false, then you can dispute those. More likely than not, those claims will still be valid. Just because Chapter 7 wipes out your debt doesn’t mean that it will cleanse your credit report as well. It’s just the opposite. Now starts the process of rebuilding your credit. You will find to find a bank or a creditor that is willing to deal with you despite the fact that you’re coming out of bankruptcy. To rebuild credit after bankruptcy you must establish a history of repaying loans. One way to do this is by applying for a secured loan. What is a secured loan? There are two different kinds. The first type allows you to borrow money against money you already have deposited. Usually, this type of loan is offered by banks or credit unions. That money will be inaccessible until you’ve paid off the loan. The second type involves the release of a loan into a savings account that you cannot access until you’ve made a set amount of payments. In other words, you’re “borrowing” money that you already have. In exchange, the bank agrees to send this information to credit bureaus. This new information will appear on your credit report. Secured cards work much the same way where you borrow against money you have on deposit. If you know someone who is willing to incur the risk, then having them cosign on a card or a loan is a viable way to rebuild credit after bankruptcy. Understand, however, this is a huge favor to ask. They are incurring the risk if you default. Eventually, an offer of credit will be extended to you. A credit card, for instance, with a $500 limit. Use this card, but pay it back on a monthly basis! Make sure your balance does not go over 30% of your limit and you will be well on your way to rebuilding your credit after bankruptcy. 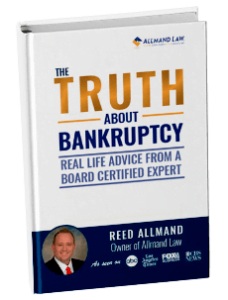 To learn more about how you can rebuild credit after bankruptcy, contact Allmand Law Firm, PLLC at (214) 740-3682 today.